March 2014. Together with Andrew Jefford, well-known wine writer, I am poised to taste two vintages of Château Le Pin, a Pomerol that, since its creation in the early 1980s, has achieved what’s called cult status. Collectors have shown themselves willing to pay several thousand pounds for a single bottle, especially for the 1982. The ’82 was, in fact, the very first vintage of this rare wine, made from a plot measuring a mere one-third of a hectare. Most amazing of all, the vines – mostly Merlot – in that first vintage were only four years old. According to the modest and unpretentious owners, Fiona Morrison and Jacques Thienpoint, it was made “in quite primitive conditions: stainless steel vats, very little pumping over or extraction; 100% Séguin Moreau new oak barrels, aged for 16 months.” Andrew, who knows the couple, adds a further insight. The malolactic fermentation, he says, occurred inside the barrels rather than in vat, a practice previously unheard of but which soon became widely emulated by awed admirers in the Bordeaux region. Something about the wine’s style – a special kind of flamboyance – caught the imagination of rich collectors, and within a few years some of these were paying many hundreds of pounds a bottle for the ’82. And that was only the beginning. That figure soon shot up to several thousand pounds per unit and the current price for that first vintage, inclusive of VAT, is around £8000. For a single bottle. And I, Frank Ward, possess a single bottle of this wine. Or rather did, until a couple of days ago. But in the early 1980s I’d possessed a full dozen bottles, today worth some £96,000 had I but held on to them. This is how it came about. In those days I was living as an exile in Sweden, a lovely country but where I was a bit like a fish out of water. To prepare for what I hoped would be a golden future, I purchased various fine wines from London-based merchants, which were then stored on my behalf at bonded warehouses pending my eventual return home. In those far-off days I had the immense good luck to be befriended by Anthony Goldthorp, then head of the respected wine merchants, O.W. Loeb. He was a marvellous man, a true oenophile who cared not a jot about a wine’s reputation, only about its intrinsic quality. It was he who pointed me, in those early years, towards the best wines of France and Germany. Every time I visited England he took my wife and me to lunch and I was automatically invited to the firm’s outstanding tastings, which featured wines from such producers as domaines Rousseau, Dujac, Gouges, Marquis d’Angerville, Château Rayas, Clos Naudin in Vouvray, Paul Jaboulet Aîné – the latter then at the very height of its powers. He even invited me to tastings hosted by Loeb at an Oxford University college, a rare privilege for somebody who, in that context, was very much an outsider. Anthony also corresponded with me on a regular basis, subtly expanding my knowledge of wine, and the art of tasting, in every letter he wrote. Growers were often present in person at the London tastings, and one got to know such leading wine makers as Charles Rousseau, Jacques Seysses, Jacques d’Angerville, Gérard Jaboulet, Nathalie Tollot, not to mention such great German producers as Manfred Prüm and Carl von Schubert. I made one such visit to London round about 1985, with the aim of using a part of my budget to acquire some of the 1982 clarets, just arrived on the UK market. As it happened, I had spent three weeks in Bordeaux in early 1983, sent there to do articles by a Swedish restaurant review and the American magazine “Connoisseur”, and was able to taste hundreds of the 1982s in situ. This gave me a very good idea of what was the pick of the crop. All the same, I was open to persuasion, especially from someone like Anthony Goldthorp. So when he mentioned a particularly fine Pomerol I’d never heard of that had just come on to the market for the very first time – Le Pin – and said he had a few cases available, I decided to buy a case to add to my collection, sight unseen, bouquet unsmelt, despite a dizzyingly high price, for those days, of around £150 per case in bond. I have many times regretted not doubling or even trebling that order. But I’ve also congratulated myself a hundred times for having any at all! For the next few years that wine, though owned by me, existed only in a virtual world: the sole proof of its physical existence was its inclusion on a printed list of my vinous holdings, sent to me annually by O.W.Loeb. But when in 1987, after 22 years away from England, I finally acquired a house with a cellar in Kent, I was in a position to have my collection, built up over some 20 or so years, cleared from bond and delivered to that new address. When the lorry from Octavian drew up outside our house I felt a very special kind of frisson. At long last I could literally lay my hands on my wines, liberating them from their cases, holding them against the light to see how much sediment they’d developed, and then binning them with appropriate reverence. Among them, of course, were 12 bottles of 1982 Château Le Pin. 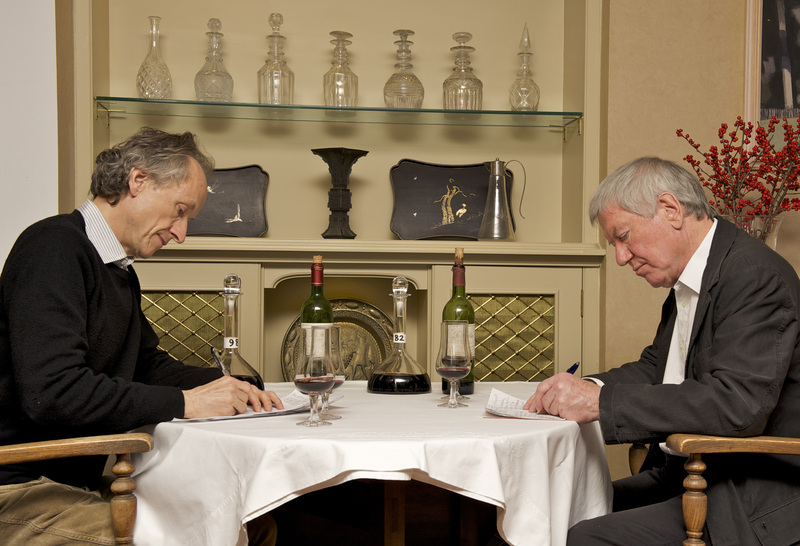 A rare sight: Two top vintages of one of the world’s most sought-after wines, moments before being decanted. The 1982 we tasted was my own very last bottle; the 1998 had been sent to me by Andrew two months earlier, to ensure that it could rest thouroughly. We had jointly decided in early 2013 that it would be a crime not to taste the wines while these last two bottles were still in our possession. We said to ourselves, and to each other, “For two pins, I’d open my bottle!” Once the thought was put into words the outcome was a foregone conclusion. I decanted the two wines at the same time, prior to Andrew’s arrival and about three hours before the tasting was to occur. I used two identical decanters, specially designed for right bank clarets by the Austrian firm of Riedel. The levels in both bottles were well into neck – in fact, perfect levels. The cork of the ’82 emerged intact; that of the ’98 broke in two but was otherwise clean and untainted. Not a single fragment of cork landed in the decanter. I resisted the temptation to sample either wine until Andrew had arrived. Then, at long last, after a wait of some six months since our joint decision to drink and not to count the cost, we were seated together, glasses charged with each of the two vintages. We decided that, after this initial tasting, followed by a second tasting (and actual swallowing) with food later this evening, we’d also re-taste them the next morning, to gauge the effect of several hours’ exposure to oxygen. The colour is a glowing crimson-purple, similar in depth and intensity to a top Corton. The flowery nose shows great refinement, emitting scents of raspberry, sweet plum, and peony. The similarity of Pomerol wines to Burgundy has often been noted: at this point I detect a certain affinity with Clos Saint Denis. Silky on the palate, the flavour shows good minerality and fine, refreshing acidity of the kind found in wholly ripe damsons. There’s a flowing quality to the aftertaste despite a faint residual rigidity at the centre, the latter trait clearly due to the wine’s still being far from full maturity. Meanwhile the nose expands to include pomegranate scents. The tannins are very fine – firm but without acerbity. Still clearly in evolution, it’s already delicious but still has a long way to go. The wine has filled out and the nose expands further to include cinnamon and sweet plum, with the most delicate hint of fig. The flavour grows richer and more intense, and I detect redcurrant and raspberry. A little later carnation (for me, a very Merlot aroma) starts to dominate, together with red rose, and there’s a reprise of ripe plum. The flavour is now rounder and the wine a delight to drink – it is, after all, fulfilling its destiny of being drunk with food. The aftertaste now has almost the delicacy of a Musigny. Now that I have a clearer idea of its constitution I’d expect it to reach a peak in about eight years and to continue drinking beautifully for a further 12-15. Nearly 17 hours later, the wine smells even more strongly of carnation and red rose, with ripe plum and plum-stone notes. There’s a hint of camphor and fine clay too. The flavour is even more delicious, and the finish again reminds me of a Musigny, though earthier. Very long. Andrew points out that Le Pin’s vinification grew a lot more sophisticated between the first harvest in 1982 and that of 1998, when they picked at an earlier date, so as the conserve the wine’s fresh fruit and fine acidity. Distinctly darker, with a faint brown tinge, this has a mellow, juicy aroma, more or less mature, of raspberry, crème de framboise, bilberry, truffle, and violet. It’s a caressingly sweet and round bouquet. The flavour is concentrated, voluptuous, and well-balanced. The tannins give texture: you feel them the way you feel the grain of the finest dark chocolate. There’s a lovely plumpness to this round, viscous wine, which is almost, but not quite, at its peak and certainly not in decline. Within 20 minutes the nose grows richer and fuller, with more weight. It’s still faintly woody, but not in an obtrusive way; it is the wood that accounts for the menthol and cigarbox notes that can now be detected. The wine being almost mature, there is very little change to be noted, apart from an emergent hint of menthol and cigarbox. My feeling now is that it could still improve very slightly over the coming 4-5 years, after which it would grow steadily lighter, but more perfumed, over the following 8-10. (Interestingly, when I’d tasted the first bottle of the ’82, round about 1988, I found it excessively oaky and aggressively tannic – and not very pleasant to drink! The same applied to the two bottles which, just a few years later, the German wine producer Armin Diel had brought along to a local restaurant to which he’d invited me to dinner). The nose is broader and earthier, with distinct hints of plum jam, blackberry, saffron, and cigarbox. Absolutely no oxidation, but the truffle element is less pronounced today. Now it’s more chocolaty, with an almost meaty aspect. There’s even a suggestion of Christmas pudding. This is full and glyceriny and markedly Merlot. An altogether delicious wine in the hedonistic mode. Andrew and Frank re-examine the two wines on the following day. Had I tasted this blind I would have guessed – because of its mellowness – that it had come from vines of at least 40 years of age. But the plants were a mere four years old in 1982. How can this be? There’s a simple explanation. When vines produce their very first harvest the yield is tiny and super-concentrated. In many cases this gives a wine that has almost exactly the same characteristics as one from old vines: density, viscosity, mellowness, and depth of flavour. After that first “virgin harvest”, as they call it in Germany, the vines regain their youthful traits and it takes quite some years before they begin to give a wine of optimum concentration and complexity. In Bordeaux as a whole, an average age of 25 years is regarded as the minimum at reputable properties. Top estates aim for a still greater mean age – 35-40+. The vines that gave the 1998 Le Pin were 20 years old at the time and those in that particular plot are now, in 2013, aged 35. The vineyard area has, however, been increased from one-third of a hectare to two hectares, so it’s likely that the average age is less than that. It should be noted, though, that yields are deliberately kept low, doubtless with the aim of taming young vines’ exuberance while obtaining the kind of density found in old-vine wines: in 1998 those two hectares were only allowed to produce 5400 bottles, which is an even lower per-hectare yield than that of a top domaine in Burgundy, where tiny yields are de rigueur for the greatest wines. This might explain why Le Pin still has the qualities that continue to fascinate collectors. At the end of the tasting I realized that, while I’d renounced a windfall of several thousand pounds by uncorking the ’82, I had gained a unique and unforgettable insight into two fabulous wines – and spent several golden hours with friends who also loved good wine: Andrew – who’d also said farewell to his irreplaceable bottle – , his wife Paula, David Matthews (one of our leading composers and a true oenophile) and his wife Jenifer. Another taster – absent on the occasion – is David’s brother Colin, also a leading composer, who would shortly be receiving a sealed phial containing precious drops of 1982 Château Le Pin. It was he who had uncorked a pre-phylloxera 1870 Château Rauzan Segla for me and other friends earlier in 2013 (See “Pre-Phylloxera Puzzle – an 1870 Overture”). Thus, though the long-cherished bottles are now empty, the memory of their contents’ extraordinary bouquets and flavours will persist in the minds of nine true wine-lovers for many years to come. As starter, duck foie gras mi-cuit with salad accompanied by the ‘06 Bâtard-Montrachet from Sauzet (still young and fairly closed-up, it resisted oxidation for the next five days!) I then served the majestic 1991 Chambertin from Rousseau, first of all on its own, then with the first slices of the utterly delicious joint of Angus beef, which had been aged for over three weeks by our butcher in nearby Canterbury. Roasted and served on the bone, it arrived at the table looking like a baby grand. 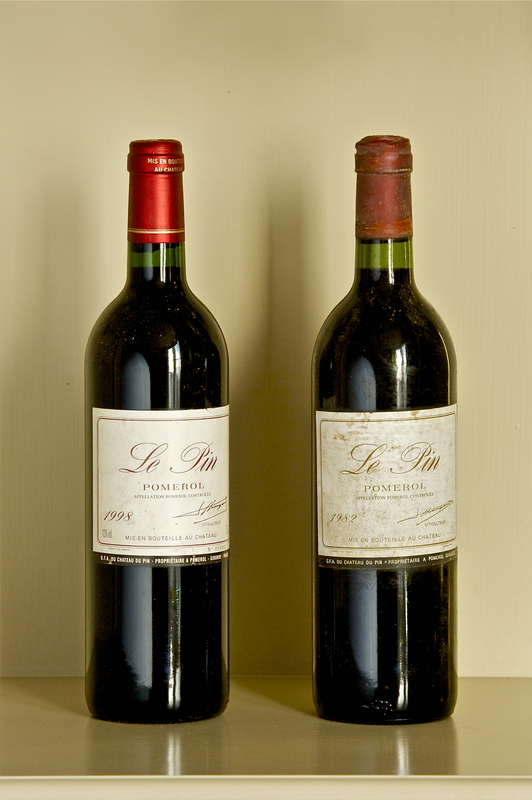 After that, with the second tranche of beef, came the two vintages of Le Pin. It should be noted that the beef was accompanied by a jus made in the following fashion. My wife Lisbet had bought in quite a lot of stewing steak which, together with offcuts from the Angus beef, she simmered over several days to produce a sublime beef consommé. Some of this delectable liquid was served, in miniscule cups, immediately after the starter, and prepared our palates for what was to follow. A part of this liquid had been boiled down still further, to make a beef jelly (à la Escoffier), a little of which was combined with the beef cooking juices to give a gravy – not a sauce – that heightened the flavour of the beef without challenging the bouquet and flavour of the two sublime vintages of Le Pin. After that, mild but characterful cheeses (brebis, reblochon) that would accord well with the two Le Pin; after which came some stronger, but not overly aggressive cheeses – farmhouse Cheddar and Salers from France. To these, altogether more assertive cheeses, I served a magnificent 1999 Hermitage Les Bessards from Delas, derived from very old plots of Syrah in what many consider to be the finest plot in all Hermitage. The dessert was a three-year-old Christmas pudding served with denuded orange segments marinated in orange liqueur. These were arranged around the dark, gleaming pudding like petals around the stamen of a flower. The rich pudding and tangy orange segments complemented each other perfectly; and the Pinot Gris SGN proved to be the perfect foil. Smelling and tasting of honeycomb, honey, and lychee, it was neither too dry nor too sweet and brought a memorable evening to a satisfying close. 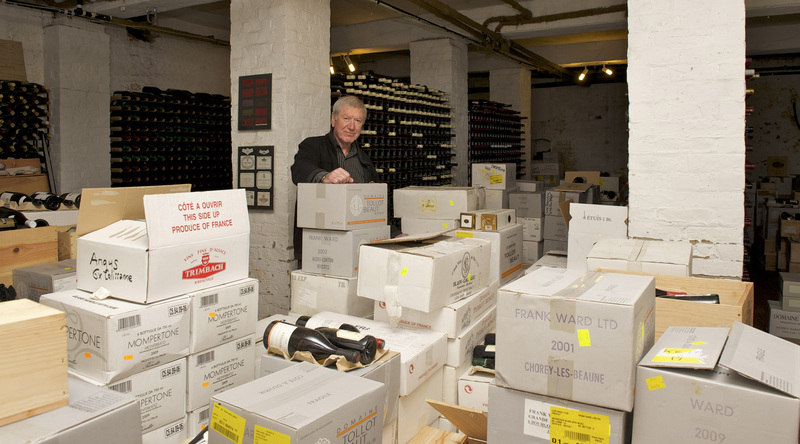 Frank Ward in his 18th-century smugglers’ cellar: which wines to uncork, now that the ’82 Le Pin is no more?